In the last days I've highlighted what I judge some of the best moments from Terrytoons, but there are several reasons why Terry Studio was considered a B one. The animation was nothing worth of note, with exceptions being the works of Tytla, Vinci and Tyer. The sound effects (I consider them one of the most important elements in a cartoon) were of the lowest quality one can imagine(no matter if a character falls from the top of a mountain right into a lake or from a diving board into a pool: you'll always hear that same darn "splash"), musical score was rarely good (the posts I've made show some very good exceptions). There would be more but the main reason to classify Terry as a B Studio was the reuse of animation (and even soundtrack). So you can see the very same sequence originally made for a 30s cartoon reused even in the 50s (!!). Judge for yourselves with what I consider good examples. You're right about Terrytoons. By and large, there wasn't a lot of imagination or creativity that went into them, with certain notable exceptions. I'm sure Terry's pennypinching probably had quite a bit to do with that, overall. As for the music, Philip Scheib and his orchestra were capable. The background music and the rhythmic pacing in cartoons such as "Jekyll and Hyde Cat" is as outstanding as any of the stuff Carl Stalling and Scott Bradley did. But over time, Scheib's music developed that "sameness" for which Terrytoons are, unfortunately, remembered. One good thing I have noted about Terrytoons --- particularly the ones done in the '40s --- is that the backgrounds are often gorgeous, some of the most beautiful background work I've ever seen in cartoons, in fact. I don't know who was responsible for that. It's obvious there were some very good artists (such as Carlo Vinci and Connie Rasinski) at the Terry studios, even if many of the cartoons weren't very imaginative. With someone like Bill Tytla at the helm, they could produce some outstanding stuff. I was impressed, for example, by the gorgeous backgrounds of "A Wolf's Tale". According Maltin's book "Of Mice and Magic", Paul Terry had a cabinet that was full of old animation scenes alphabetized from previous cartoons and insisted his crew to reuse an old sequence whenever a spiecal scene was needed for a cartoon because Paul didn't want to waste the studio's budget much. That part pretty much explains why they used this bad habit alot. have you read that bit about the piano/harp? It's hilarious! I even got that cartoon and was amazed to hear that. To everybody else: the name of the cartoon escapes me at the moment, but it was Terry's first Technicolor entry, a Jack and the Beanstalk retelling. Instead than spend money for someone to play an harp he just used a pianist. So you see an harp playing and you hear a piano! 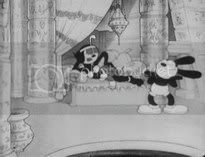 The music problem is interesting, since every other cartoon studio from the Golden Age had access to the rights of the music done for its parent company's feature films (save Disney, which created it's own popular music). Even when the studios were independent, like Terrytoons, the Fleischers had access to the Paramount music catalogue, Schlessinger had access to Warners' library and Lantz could use music from Universal features. Even though Fox was known for its musicals -- stretching from the Shirley Temple ones of the 30s to "Gentlemen Prefer Blondes" with Monroe and Russell in the 1950s -- poor Phillip Scheib was never able to use one note of those scores in a Terrytoon. You'd think Fox would want the publicity of using their music in as many places as possible and would allow Terry to use the songs for free (in the same way he didn't have to license CinemaScope in the 50s), but either they were too money hungry or Terry was too lazy to work out a deal that would have taken away at least a little bit of the monotony of Scheib's scores. Yeah, I read the part about the cartoon "String Bean Jack". However, I wanted to see it to believe it. So Dodgers, could you please posted the clip from that cartoon, please? Thank you. guess I'll extract just that part. Just gimme a bit of time. I'm pretty busy these days even if I'm forced to stay at home. Wow! That's a large use of resued animation in this Terrytoons cartoons. Thanks for sharing with us! I like Scheib's scores, though they do become repetitive. Gene Deitch wrote that he was wary of Scheib at first, thinking him unable to adapt, but found him willing and a talented composer. Anderson Craig and Art Bartsch were the chief background artists at Terrytoons.